The contest has ended, and thanks to Random.Org a winner was selected. Lisa from Sweet As Sugar Cookies was the #8 comment that was randomly selected. Lisa has been notified and responded with her information and will be receiving her prize from My Blog Spark. Thanks to everyone for entering! I think by now I’ve made it abundantly clear that I’m a lemon and lime freak, right? I’ve shown you various recipes where either of these citrus fruits are a core ingredient and instead of adding the normal amount to the dish I always end up doubling, or even tripling the amount. I can’t help it. If a dish calls for lemon or lime I want that to be the dominant flavor. It’s just the way I am. Pork Milanese is one of my favorite dishes to cook up for so many reasons. Besides it being delicious, it’s also simple, quick, and of course, filled with lemon flavor. Normally when I bread the pork chops I use seasoned Italian Bread Crumbs. But ever since the wave of Panko has hit the store shelves I find myself either using Panko in place of bread crumbs, or as an accompinament to the breadcrumbs. Then of course I add the lemon and heaven begins to sing down on my plate. 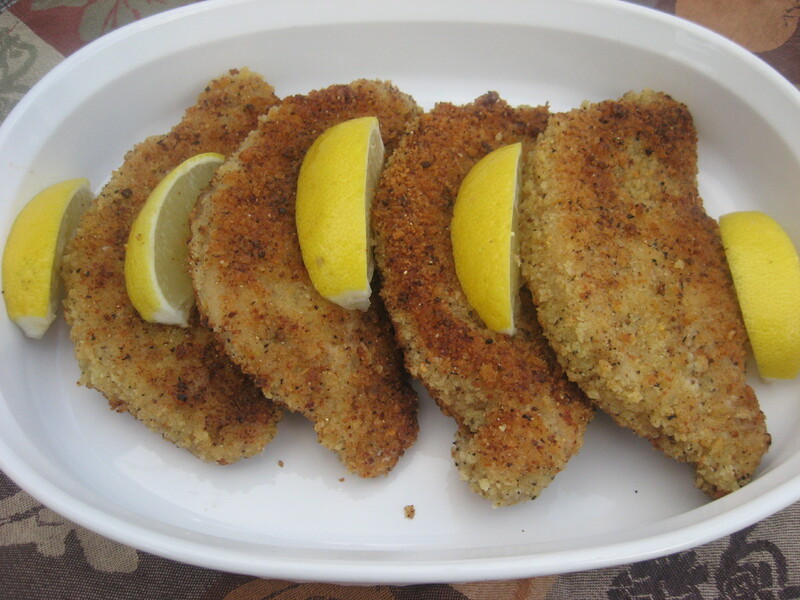 gave me the opportunity to try out this new Progresso Lemon Pepper Panko I knew just what I wanted to try with it! To me it was the perfect addition to this dish because it infused even more lemon flavor into the dish. Not to mention the additional crunch it added to these chops! If you are a lemon lover, give this one a try. It’s easy and delicious! In three shallow bowls or pie plates add the following; one with the Panko and parmesan cheese, one with the egg and milk and one with the flour. Begin by dredging each pork chop through the flour, then the egg and then the Panko. Make sure to press the Panko into each chop well. Allow the chops to rest on a plate for a few minutes. In a heavy cast iron pan (or other frying pan that is safe for oven use), add the oil and butter and allow to heat up. Once hot, fry each pork chop on each side until golden brown. Once done, transfer the pan to the oven and allow to cook for an additional 10 to 12 minutes, or until cooked through. Serve immediately with lots of fresh lemon wedges! *Note* I recommend using any additional salt and pepper in this dish sparingly. The Panko and the parmesan cheese really already has enough salt in them. I actually didn’t find the need to add any additional salt or pepper to this dish before or after cooking. and General Mills, they’ve made this giveaway possible. And they not only sent a gift of each of these to me, but they will send another to one of my readers who wins! If you’ve ever watched Michael Chiarello on Food Network you know all about the beautiful food he serves up. 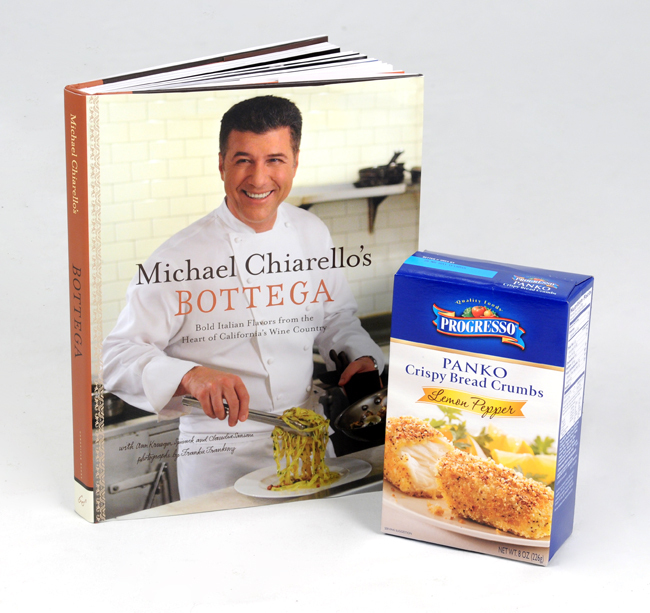 He has a new cookbook out and you get the opportunity to win an autographed copy of it, along with a package of Progresso’s Lemon-Pepper Panko. This cookbook is gorgeous and BIG. There is definitely something for everyone in here to enjoy. It’s gorgeous. What do you need to do to win? Simple. You have the opportunity to enter twice each day during the duration of the giveaway. I’m running this giveaway for a week so that gives you up to 14 chances to enter. Each day leave one comment telling me what you are eating that day or what you wish you were eating that day! Each day Tweet about this giveaway and leave me one comment with the link to your Tweet each day. Be sure to include your email address with EACH entry on EACH day so I can contact you if you win! This contest for residents in the Continental United States only. The winner will be contacted within two days of the close of the giveaway and will have two days to contact me via email with their mailing information so their package can be mailed out. Failure to do this within that time frame will result in my picking a new winner. Your prize will be sent to you from My Blog Spark, not Bored Cook in the Kitchen. Please allow a few weeks for delivery. No entries after 11:59 p.m. EST on Thursday, November 18, 2010. The winner will be randomly selected within two days of the close of the giveaway. Disclosure: This giveaway was generously provided through My Blog Spark and General Mills. Neither My Blog Spark or General Mills is paying me for this review or giveaway. Michael Chiarello has no idea I’m offering this giveaway or who I am, but I think he’s cute!